Farhan Akhtar is all set to play a Bhojpuri singer in his upcoming film titled 'Lucknow Central'. Farhan took to his official Twitter handle and tweeted the first look of the film. The poster is catchy and portrays Farhan Akhtar in a totally new avatar that his fans have never seen before. With a tilak on forehead, a simple shirt and half sweater, Farhan Akhtar is looking simple and innocent, and this simplicity makes it even more convincing. Seems he has prepped up for the role brilliantly. In the first look of 'Lucknow Central', he is seen holding a slate inside the bars. Yes, he is a prisoner and his name is Kishan Mohan Girhotra who is not called by his name but by his number- १८२१ (1821). He is imprisoned at Lucknow Central. With the first look, Farhan Akhtar captioned his tweet- "Ye hai Kishan Mohan Girhotra .. jail mein isse १८२१ bulaate hain. #LucknowCentral #firstlook #15september2017"
According to a leading daily, Farhan signed 'Lucknow Central' for two reasons- first, to experiment his film roles and second, to connect to the masses more. To be noted here is that he is a big fan of Bhojpuri actor and singer Manoj Tiwari. 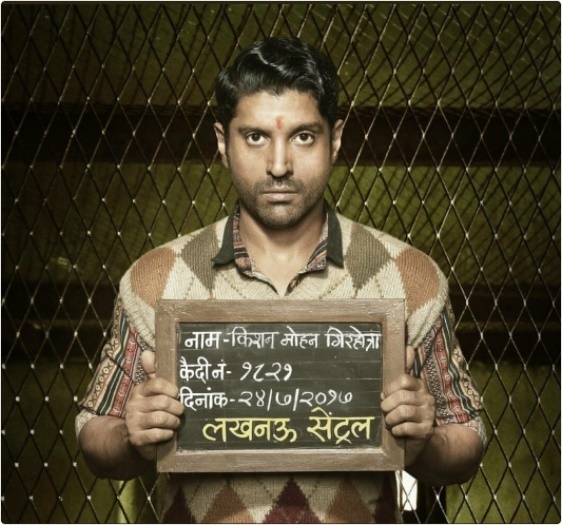 'Lucknow Central' is about Kishen Mohan Girhotra who is jailed on charge of murder but he is innocent. This leads to his own movement of freeing people who were wrongly accused of crimes they never committed. Whether the court convicts him or acquits him needs to be seen. And that we all would know on September 15 when 'Lucknow Central' will release. The film has been directed by Ranjit Tiwari. On the work front, Farhan Akhtar will also be seen in 'The Fakir of Venice' alongside Annu Kapoor, famous Dr Chadda of 'Vicky Donor'. Farhan’s last film 'Rock On 2' was a huge flop at the box-office. Will 'Lucknow Central' help Farhan revive his last box-office failure?